This is what we call proper traditional English food. 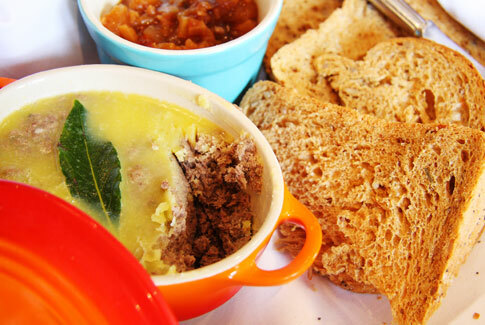 Nothing beats potted meat served with fresh crusty bread and a fruity home-made chutney. Great for picnics, light lunches, a starter and freezes beautifully, so make more than you need. This needs to be cooked overnight, so think ahead! People travel from far and wide to come to the Pot Kiln and eat this, our most famous dish. It was inspired by the French form of butchering a “slab or tile” from the haunch of beef or lamb. It involves separating the primal muscles from the thigh, then trimming off all silvery sinew and fat until you are left with a piece of meat that looks like fillet but has the flavour of rump. 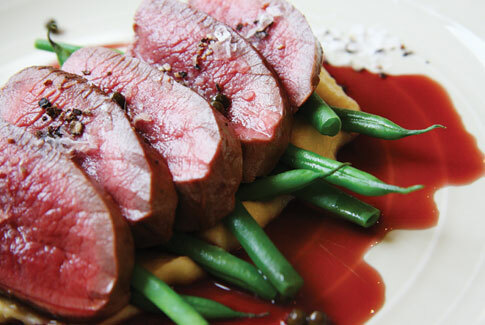 Not many people realise you can eat Muntjac. These little Chinese deer came over to the UK with the Duke of Bedford for his deer park at Woburn Abbey. They quickly spread and can now be found almost everywhere. The meat is dense and flavoursome. It can be treated like lamb in lots of ways as it is delicious both pink and slow cooked. 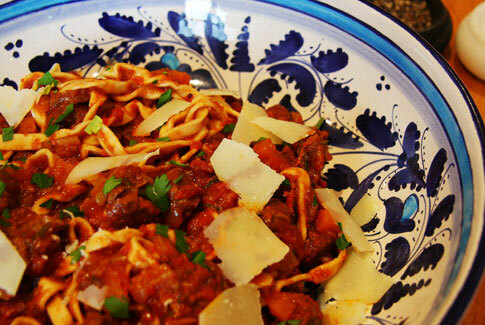 We use it in this recipe as it holds its texture very well and makes a wonderful winter feast. Buy fresh dried tagliatelle for this, De Cecco do a good one.